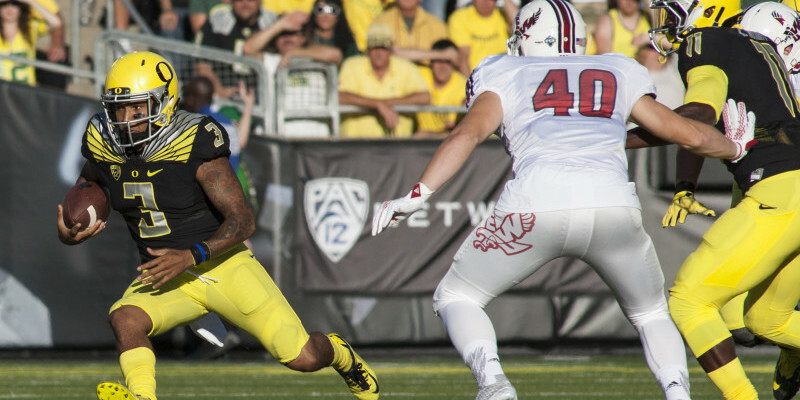 Eastern Washington fought the Ducks fiercely and cleverly Saturday, but a surprisingly competitive game was ruined by a cheap hit on Oregon quarterback Vernon Adams by one of his former teammates. After Adams scrambled for seven yards and slid to the ground untouched, EWU sophomore rover John Kreifels dove on top of him, delivering a helmet to helmet hit that left Adams unable to walk upright for some time. Kreifels was immediately ejected, but then taunted the crowd as it booed, by making the “bring it on” motion with his hands. Oregon quarterback Vernon Adams (3) and running back Royce Freeman (21) running the bread-and-butter. EWU quarterback Jordan West, who was impressive as Adams’ replacement before leaving the game with cramps, agreed. Is there any history between Kreifels and Adams from their time as teammates? Coach Baldwin said not. He did imply that Kreifels had been told previously to temper his dangerous tackles. Kani Benoit escapes from the clutches of an Eagles defender. The big star for Eastern Washington was wide receiver Cooper Kupp, who had 160 yards receiving in the first half alone. He finished with 246 yards and 3 touchdowns. Asked if he might follow his former QB to Oregon, Kupp hinted that they are more likely to meet up in the NFL next year. One of Kupp’s strength is yards after catch, as on the 73-yard bubble screen he took down to Oregon’s 2-yard line. His quarterback Jordan West just shook his head in amazement. Kupp and West were helped by coach Baldwin’s impressive offense, which gave the Ducks trouble all night. He said there’s no catchy name for it, no simple defining play. Defensive backs Arrion Springs (1), Chris Seisay (12) and Reggie Daniels (8) celebrating. Kupp agreed, noting that Oregon was a very tough opponent. It’s just a shame that such an interesting schematic chess match was obscured by one bad play.